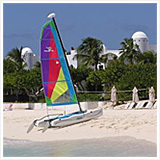 Anguilla is undoubtedly beautiful. 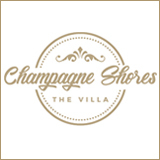 Beyond the island's pristine white beaches and clear waters, there is so much waiting for all of the nature lovers, bird enthusiasts and explorers out there. 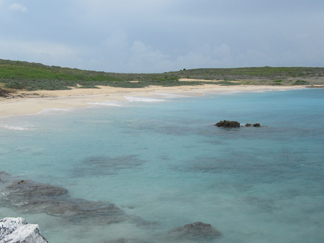 I recently tagged along with the Anguilla National Trust on one of their trips to Dog Island. They were doing a census on the nesting sea birds. 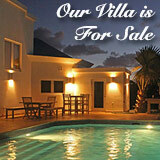 I thought this would be a great opportunity to see a different side of Anguilla. We had to meet at Sandy Ground at 8am, bright and early. It wasn't so "bright" though. Gray clouds created a blanket over the entire island that morning. 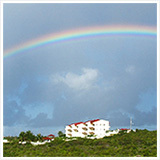 With a storm looming over Anguilla, the sea was surprisingly placid. The overhead clouds gave it an eerie color. "Everything about this trip screams ominous," as Carl, an ANT member, put it. It was true. 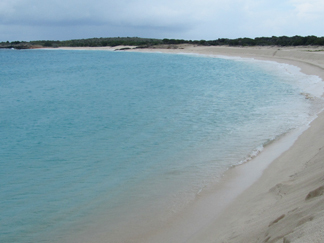 Dog Island is Anguilla's furthest outlying cay. 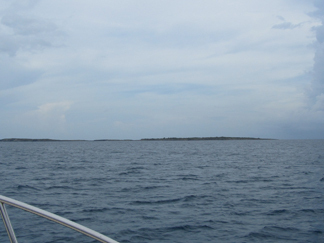 While heading out to it we passed a number of neighboring little islands, like Sandy Island and Prickly Pear. When we finally reached Dog Island, we cruised around it to a small crescent beach. Immediately I was awe-struck at how strikingly blue the water was and how clear it was. The contrast against the grey sky was beautiful. Anchoring the boat to shore was probably the funniest and riskiest part of the trip. Because of the low tides, Devon, an ANT member, had to grab the anchor and run up a 3-4 foot bank to sink the anchor securely on top. A challenging feat for anyone, but with our cheers driving him forward, Devon picked up the 40 pound anchor and dashed for the shore. Of course he could only move as fast as the sand would let him. With every awkward, sinking step, stream of sand were rolling down. Nevertheless, Devon's strategy worked. Then, it was up to us to successfully jump from the boat onto the shore. Timing was everything. 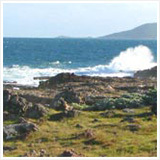 The hike would take us along the eastern coast of Dog Island. We'd stop at an area called Savannah, and then hike inland back towards our boat. 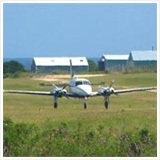 Savannah is an area on the north-east end of Dog Island with a stretch of rich green fields and a beautiful beach. Be careful not to touch any plants or you might end up with a nasty rash, since there's a grove of Manchineel trees growing here. This is where we docked the boat. This is where we headed once on shore. We walked along the east coastline to get there and then cut across the land to return to the boat. 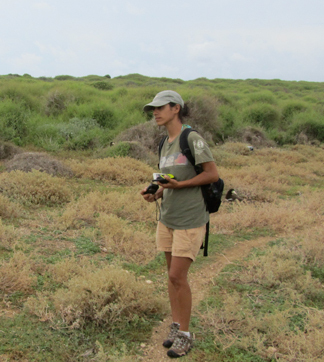 After orienting ourselves we were off, with Farah leading the way. Farah is the Executive Director at the ANT. 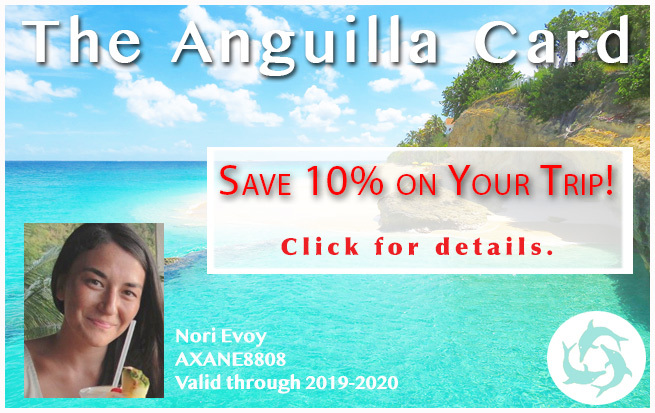 She and her team work very hard to preserve Anguillan heritage and wildlife. 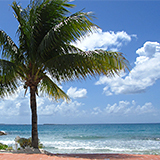 The ANT is very knowledgeable about Dog Island and its inhabitants. They provided so many fun facts along the way. The first sight we saw was not the most welcoming. 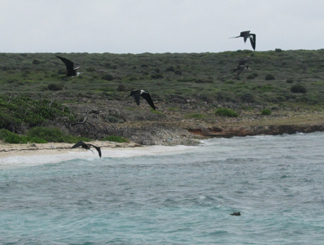 A group of female frigate birds were ganging up on one small Booby, trying to steal its fish. I know, this island just gets more and more daunting, but it gets better, I promise. After watching the show, we were relieved that with one very agile move, the Booby was able to fly away safely... for now! The ANT got to work counting all the nesting Boobies and I "got to work" taking in the wonderful scenery as we hiked along a trail that runs along the east edge of the island. I've mentioned the word "Boobies" one too many times, and before anyone gets the wrong idea, we're talking about the very common sea bird. There are two types of Boobies on Dog Island. 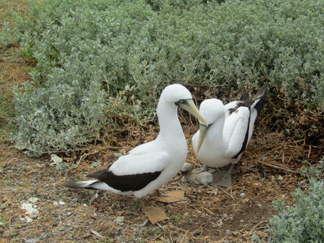 The Brown Booby, which, as the name describes, is brown, and the Masked Booby which has a white body but a black face. No one knows why they're called Boobies, but I have a feeling it has something to do with that vacant stare of theirs. Brown Boobies can be told apart by their bills. Males have blue bills while females have pink ones. Masked Boobies on the other hand can be told apart by their feet. 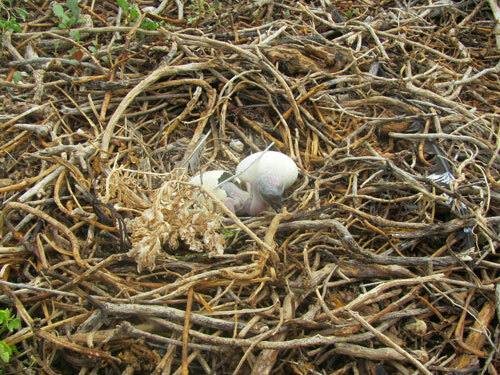 We even spotted some hatchlings emerging from their shells, and some soft feathery infant Boobies! 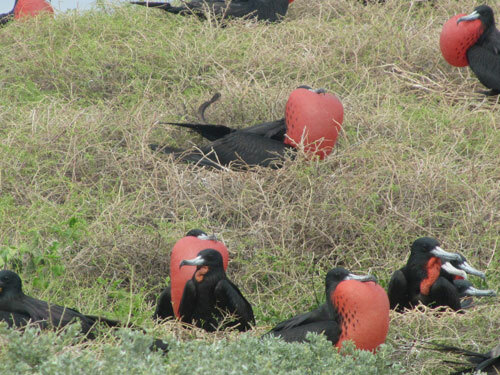 There were so many pairs of adult male-female Boobies hanging out together that at one point, I thought they should consider calling the island "The Island of Love". 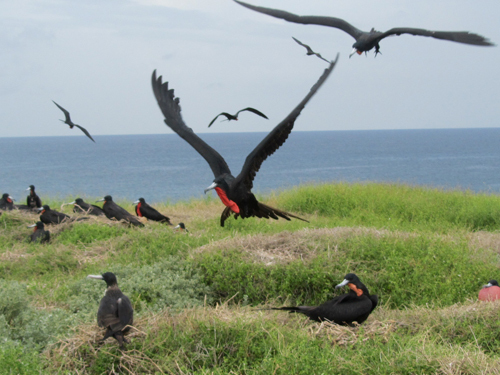 About half a mile down from the Booby nests were areas occupied by magnificent Frigate Birds, or Birds of War as they're also called. Their wingspans were massive and their beaks terrifying. 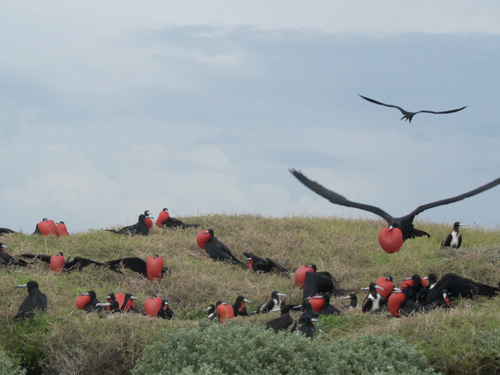 The males put on a glorious show flying overhead with their eye-catching red and black speckled sacks filling the air. There were so many of them flying over that I couldn't help but think about Alfred Hitchcock's 1963 film, The Birds. 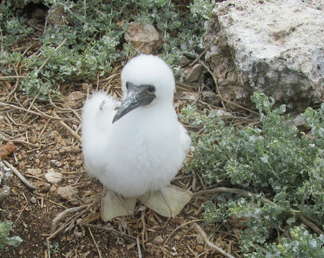 After our run-in with the Frigate Birds we went back to counting the nesting Boobies along the coastal cliff. It was a real nature-filled day. 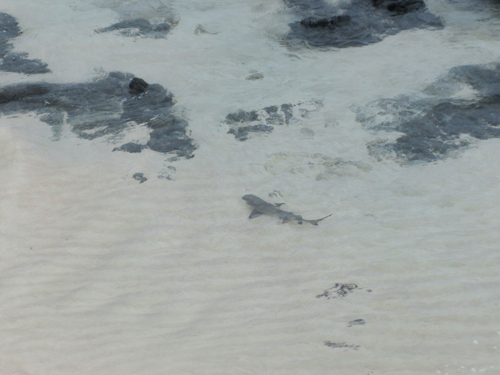 We even spotted a nurse shark from a cliff that overlooks a small beach. It was so close to shore it was practically on the sand. By the time we got down to the beach it was already gone, but no sweat. The beautiful stretch of white sand and perfect waves and the rich green fields distracted us from the disappointment of missing an up close encounter with the little shark. 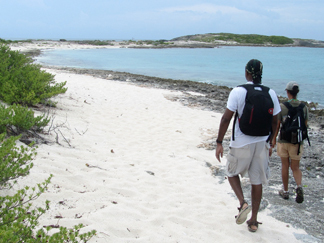 After a short break, we trekked back across the island. It was time to get back on the boat, which wasn't very graceful at all. Getting onto the boat you'd think would be a lot easier than getting off. But the wind had picked up and now the boat tugged forcefully against the anchor, pulling it away from shore. Our friend Lyndon was the first to attempt climbing on, but after a half a second of hesitation, the boat pulled away from the shore with only half of Lyndon's body on board. He lost his balance and fell backwards into the sea, soaking everything. At the same time, the rope connecting the anchor to the boat sprang up nearly launching Louise, who was trying to hold it still, into the air. It dragged her for a few feet before loosening up enough for her to let go. We could tell that this beautiful island just didn't want us to leave, but with a few more attempts everyone got on safely, and with just a few battle-scars we were off. 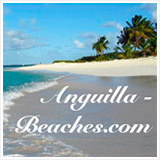 But not back to Anguilla, the work was only half-way completed. We were Prickly Pear bound. There, our day mellowed out. There weren't too many birds to count. So, after walking the whole perimeter of the island and taking a quick dip in the sea, it was time to go back to the "main land." 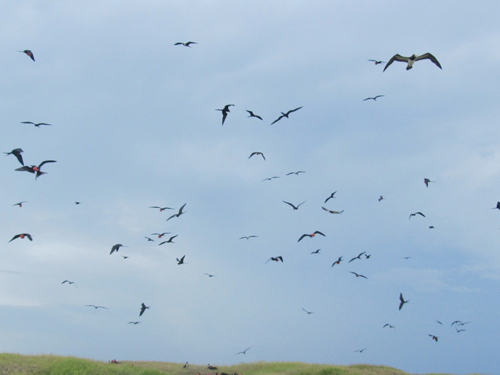 In total, we counted more than one thousand sea-birds. "Excellent results," said Farah. At the day's end I left being so impressed with Dog Island. 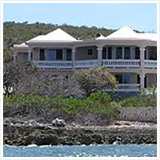 Undisturbed, Dog Island is truly wild and rich with natural beauty and interesting sights. Thanks for letting me tag along, ANT. The ANT visits and surveys Dog Island frequently. 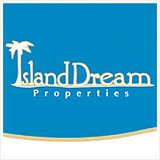 Seeing the island with them lets you get in touch with all Dog Island has to offer. If you want to join the ANT on their excursions, feel free to get in touch with them. More on the ANT here.